New Lemon Lime Flavor and higher levels of Vitamin D3! 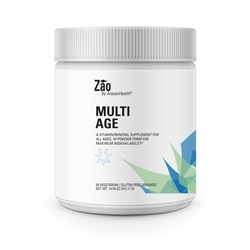 Zao® Multi Age combines over 56 nutrients that support brain, bone, immune, cardiovascular and metabolic functions throughout the aging process. * It is free of copper and iron, which make it easy to incorporate into the diet of highly sensitive individuals. Bone Support - Calcium, Magnesium, Phosphorus, Vitamin D3 and Boron support growing and mature bones. Magnesium assists with calcium and potassium uptake while boron is needed for the metabolism of calcium, phosphorus and magnesium. Along with promoting strong bones, calcium helps to protect bones and teeth from leady by inhibiting its abosorption. * When calcium is deficient, lead can be absorbed and deposited in the teeth and bones. As a dietary supplement, mix amount below in cold water or juice (6-8 oz) or as directed by your health care provider. For best results, use a blender or shake well. Children (4-12): 1/2 scoop daily with a meal. Over 12: One (1) scoop daily with a meal. One sccop (13 g)contains: Calories 47, Total Fat < 1 g, Total Carbohydrates 9 g, Total Protein 2 g Vitamin A (Acetate) 2,000 IU Beta Caroten (Provitamin A) 7,500 IU Vitamin C (Calcium Ascorbate, Ascorbic Acid) 500 mg Vitamin D3 (Cholecalciferol) 1,000 IU Vitamin E (d-alpha tocopheryl succinate) 200 IU Vitamin K 90 mcg Folic Acid 200 mcg Thiamin 35 mg Riboflavin 35 mg Niacin 10 mg Niacinamide 25 mg Vitamin B6 35 mg Vitamin B12 (Methylcobalamin) 75 mcg Biotin 150 mcg Pantothenic Acid 35 mg Calcium (Ca Citrate) 500 mg Iodine (from kelp) 50 mcg Magnesium (Mg. Citrate) 250 mg, Zinc (Gluconate) 10 mg Selenium (Se. Amino Acid Chelate) 75 mcg, Manganese (Mn. Gluconate) 2.5 mg Chromium (Chromemate GTF) 100 mcg Molybdenum (Mo. Amino Acid Chelate) 30 mcg, Potassium (K. Citrate) 25 mg Lecithin 175 mg Mixed Citrus Bioflavonoids 100 mg Choline (Citrate) 80 mg Inositol 65 mg L-Glutamine 50 mg L-Carnitine 50 mg Linoleic Acid 50 mg PABA (para-aminobenzoic acid) 35 mg DMG HCl 25 mg Alpha Lipoic Acid 20 mg Stevia 35 mg Hesperidin 12.5 mg Rutin 12.5 mg Pectin 12.5 mg Betaine HCl 10 mg Enzopharm® Plus 8 mg (A proprietary blend of vegetarian enzymes: amylase, protease, lipase, hemicellulase, and lactase) Coenzyme Q10 5 mg RNA (ribonucleic acid) 5 mg Silicon (Horsetail Rush) 4 mg Bromelain 2 mg Papain (Enteric Coated) 2 mg Cellulase Enzymes 2 mg Boron (B Amino Acid Chelate) 1.5 mg Octacosanol 500 mcg Vanadium (Vanadyl Sulfate) 10 mcg Other ingredients: xylitol, natural lemon-lime flavor xanthan gum, citric acid. Allergy Information: This product contains lecithin (from soy).